Erin Steinbrugge is COO of Crowdsource.com, where she authored the Growth Hacking 101: Rookie Template; and is a contributor to the Accelerate St. Louis startup ecosystem. What exactly is a Growth Hacker? But what does that actually mean? An overly simplistic definition would be that growth hackers are an emerging breed of marketers who excel at leveraging technology in clever ways to rapidly grow a business. Further refined, however, I would add that leveraging technology “in clever ways” is not the equivalent of taking traditional marketing practices and translating them to a digital environment. Nor is the growth hacker focused on the common digital marketing mix of e-mail, SEO, PPC, content strategy and social media. Those channels and tactics are tools in their toolkit, but they know better than to get caught up in the deluge of online advice on content strategy to squeeze one more like out of each Facebook post. Every brand on the planet is doing that, and few are experiencing the kind of hockey-stick growth seen by companies that have landed a truly savvy growth hacker. The growth hacker is two parts nerd, one part marketer and one part rebel. Although “Growth Hacker” as a title makes me twitch a bit, I’d be lying if I didn’t admit this fusion excites the inner nerd-rebel in me. 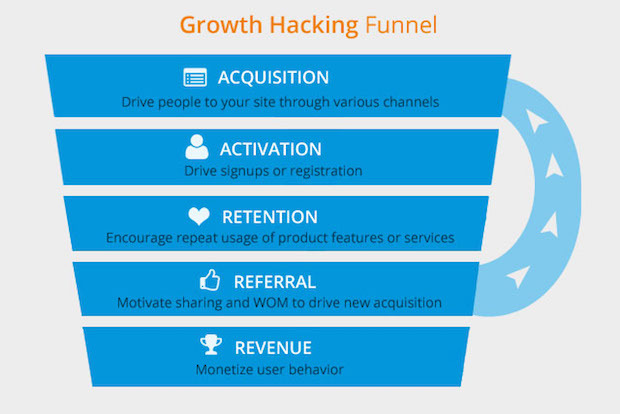 The day-to-day obsession of the growth hacker is to focus on the growth funnel (above), or more specifically, to increase the rate at which people move through each stage of the funnel. They leverage technology in ways that rapidly increases the rate at which a customer moves from acquisition to revenue, with heavy emphasis on motivating viral sharing at the referral stage, on a continual basis, in order to replenish the funnel. In the early stages of a new product (or campaign) launch, growth hackers pay close attention to the conversion rates at each step of the funnel. They then A/B test, evaluate results and optimize tactics to accelerate the speed at which people move through the funnel. He or she pays close attention to signals that the funnel is unhealthy at any given stage, and understands where to apply pressure. For example, if ad campaigns are successful at driving people to a website (acquisition), but conversion rates are low on signups (activation), it makes sense to optimize activation strategy rather than adding more fuel to the marketing engine that is driving acquisition. Of particular emphasis is the referral stage of the funnel, in which growth hackers rely on viral sharing and word of mouth to drive additional acquisition, resulting in rapid growth on a lean budget. This is where being savvy with technology comes into play. Some of the greatest success stories in growth hacking have come from companies that have repeatedly innovated, tested and optimized their referral strategies. Some familiar examples include Uber, AirBNB, LinkedIn, DropBox, Hotmail and Zynga. These companies also have been savvy with leveraging existing open platforms to accelerate the acquisition of new users. 1. Optimizing the Sales Funnel: A solid lead generation program and a healthy pipeline are two of the most critical things that a growth hacker can contribute to the enterprise. Recent years have massively disrupted the traditional buying process, and buyers are doing their own research online long before contacting a sales representative. According to Forrester, buyers are anywhere from two-thirds to 90 percent of the way through their decision-making process before they ever reach out to a vendor. A Growth Hacker will use data to build a solid, online lead generation program that establishes marketplace authority will convert leads into revenue much faster than traditional selling methods. 2. Leveraging Actionable Data: Big data has become an integral part in solving everything from marketing challenges to world problems, but despite increased accessibility to data, many marketers still struggle with leveraging it to achieve results. A study by IDG found 61 percent of marketers are frustrated with the quality of leads. This same study revealed that marketers lack the data they need to make informed decisions about the optimization of their lead-generation programs. A growth hacker should be savvy with manipulating and interpreting data in a way that is informative and actionable, even for the largest of enterprises. 3. Learning to Fail Fast: Large enterprises in particular have a habit of investing heavily in marketing initiatives before success is proven or disproven. When the stakes are high, a growth hacker will uncover “shortcuts” to failure. This may sound counterintuitive, but it is a valuable process because it allows the enterprise to adapt and pivot quickly — before a large investment is made. The concept of embracing failure is foreign to many business-minded professionals. Growth hackers remove the stigma of “failure” by rapidly testing new ideas and discarding the ones that don’t work. 4. Embracing Automation: Paradoxically enough, many great programmers and growth hackers are known for being lazy. Not in the sense that they don’t show up for work, but in their approach to problems. The right combination of cleverness and laziness can pay off big when it comes to finding the simplest, most effective solution to any problem. Growth hackers will leverage technology to automate time-consuming, redundant processes. Getting around extra work with automation frees up time to test new ideas and ultimately fuels innovation and growth. This inherent “laziness” introduces fresh, new solutions to age-old problems that even the most legacy-bound enterprises can benefit from. 5. Establishing Predictable Viral Lift: Discussions and case studies on viral lift tend to revolve around technology startups. Why? Startups, by nature, are in an early period of testing and learning, scratching and clawing their way to success, whereas the mature enterprises are often in a state of retainment. Virality is not something that can be planned or purchased, it happens when a product or message is worth sharing. Achieving predictable viral lift in the referral stage of the funnel requires significant testing and iteration. Growth hackers can help enterprise businesses view opportunities through the eyes of a startup, uncovering opportunities to apply technology solutions that support and accelerate viral lift. Taking a “startup” mentality to optimizing the growth funnel can have a profound impact on businesses of any size, and at any stage of the lifecycle. Although the title of “Growth Hacker” might be more of a buzzword than something you are likely to see in your organizational chart five years from now, the key attributes and skills of a successful growth hacker are likely to become the most desirable skills in marketing candidates for years to come.